These days we're used to seeing bio text on the back of Minimate packages, but it was Series 19, released in February 2008, that was the first to have it. 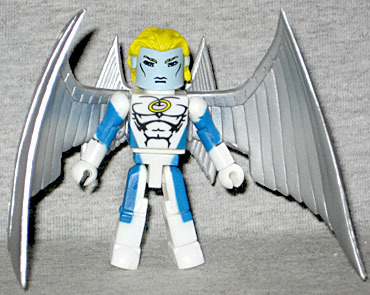 Transformed by Apocalypse's technology, Warren Worthington became Archangel and served as the Horseman of Death before freeing himself of Apocalypse's control. This is the "classic" Archangel, in the pink and blue costume he wore for seven years straight (in our time, not in comicbook time).The details are crisp, and go all the way around his body, rather than stopping on the sides. His wings, separate pieces that plug onto the figure's back, are huge and detailed appropriately. They never did explain why Warren's skin turned blue, did they? Whatever the reason, the specific color chosen for this figure seems straight from the comics. If you don't want to see it (or want him to specifically not be the heroic version), the set includes a golden skull mask that fits snugly on the head without any pegs or anything. Born En Sabah Nur, Apocalypse possesses near-unlimited immortality and can alter his body at will to further his goal of creating a master-race capable of surviving forever. 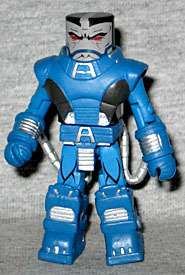 Apocalypse is one of the first Minimates to be "biggie sized" - previously figures like Wolverine and the Hulk were the same height, but Apocalypse has extra pieces designed to make him taller than average. His legs actually end about halfway down his boots, and his waist piece is thicker than average. His boots, gloves, waist and chest cap were all new sculpts when they came out. There are hoses connecting Pocky's belt to his elbows, but they're very stiff and serve no purpose but to limit his movement. 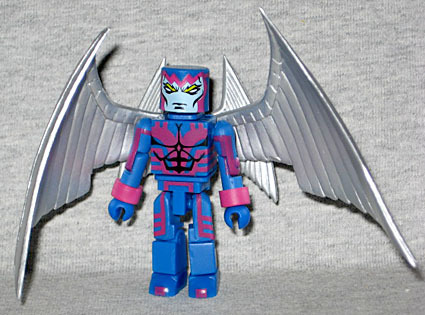 This set was the one in Series 19 to have a variant - a second version of Archangel. Still attempting to reclaim his humanity, Archangel's transformation at the hands of Apocalypse would have long-lasting effects on this founding member of the X-Men. Warren wore the suit Apocalypse designed from Nov 1987 to December 1994, and then switched to a costume reminiscent of the one Magneto designed for him. He really has a tendency to get clothes from villains, doesn't he? The figure has long blonde hair, which has been reused several times since its release, and his face seems to be painted too high on his head. He comes with the same wings as the other Archangel, and thus the same "back sheet" to add the balljoints necessary to plug them on. Apocalypse and the normal Archangel are both good additions to the Minimate ranks: you've got an important villain and a recognizable X-Man in his most familiar form. You can pretty safely pass on the variant, though, because it's just nothing special. This entry was posted in Art Asylum, Marvel, MMMR and tagged Minimates, X-Men. Bookmark the permalink.